F/1.7 MF Lens for MD mount. Minolta MC ROKKOR-PF 50mm. Lens Filter. The glass of the lens is very clear. There is tiny scuffs at the junction of the mount. The focus ring moves smoothly. Front cap. Model : MC ROKKOR-PF 50mm f/1.7. User's Manual : None. Condition : Used ! Tiny scuffs from normal use. NoBalsam separation. 【Functional】. ■Optical system(Lens). Appearance : Near Mint. I think that the picture will be affected. Helicoid and diaphragm work smoothly. ■Functional. This item is very clean and very beautiful. We send a product by. Minolta MC ROKKOR-PF 50mm 1:1,7 lens in extremely good condition! Perfect glass, clean aperture leafs and smooth focusing. Practically no signs of use. Made in Japan. This is a previous owned & used lens. Small amount dust in the internals of the lens, does not affect picture quality. Overall, an excellent lens in good, tested condition. Aperture is oil-free and fully functional. Tiny scuffs from normal use. It shows signs of use. ■ Functional. There is No separation. There is No scratches. Near Mint . tiny scuffs from normal use. There is no scratches. There is no fog. I send a product by above specified transport policy. # Appearance. There is no oil bleeding in the lens aperture blades. Thin haze is found when checking with light. Excellent . tiny scuffs from normal use. ■ Functional. There are tiny dusts. The exceptional sharpness, brilliance and bokeh rendition of this lens surpasses that of the famous Minolta Rokkor PF 58 mm F1.4 MC lenses. Minolta MC Rokkor PF 58 mm F1.4 for Canon EF-S Mount Lens. Yes, lens will focus to infinity and even a half of mm beyond infinity for finest infinity focus! Crisp Minolta MC Rokkor-X pf 50mm f/1.7 lens with a protective leather case! Comes with both lens caps. Nearly flawless condition! Made in Japan. If you have any questions regarding this item or if you wish to see more images please message me. Few tiny scuffs from normal use. ■ Appearance. poor appearance. Pre-owned, normal signs of use. It works properly. ■ Functional. There is no separation. There is no scratch. It has fungus to middle lens and rear lens. This lens is good. - It has fungus. (Middle and Rear Lens). It works properly. ■ Functional. - No fog. 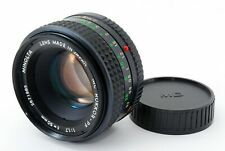 Minolta MC Rokkor-PF 50mm f/1.7 Manual Focus Lens w/hood [excellent] #500 from Japan F/S ! Front Cap, Rear Cap, Hood. This lens is clean. ◆Lens&Optical system. There are tiny dusts inside the lens. Optical condition: B There is thin haze. There is a tiny fungus on front lens. Slight dust in lens. This item is also sold over the counter. We are located in Japan. As Is. There is many fungus. Everything is shown on the pictures. I will do my best to solve the problem with you. Note(Important). Used (For Repair). I will list below what I could see with my eyes by applying a strong light from the front lens and the rear lens. AS-IS Present condition product. It works properly. Optics are very beautiful! No balsam separation. Tiny scuffs from normal use. ■ Functional. There is no fog. Beautiful condition. I send a product by EMS. There is no haze on inside of the lens. Including Front Lens Cap (Compatible product）. Rear Lens Cap（Compatible product）. (But of course it does not affect the photos.). Condition EXCELLENT. I will provide courteous and responsive service. ). Maximum Aperture 1.7. Focal Length 50mm. Minolta MC Rokkor-PF 50mm F2 Lens For Minolta MD Mount! Good Condition! Focus and aperture rings move freely without resistance. Lens is free of fungus and scratches. Minolta MD. Lens Mount. Serial Number. Minolta MC Rokkor-PF 50mm f/1.7 Manual Focus Lens [excellent] #508 F/S !! This lens is clean. ◆Lens&Optical system. There are tiny dusts inside the lens. There is no fog on inside of the lens. This lens works fine with no problems. You can enjoy taking photos with the lens in good condition. 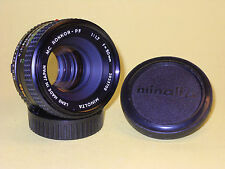 【Near Mint】Minolta MC Rokkor PF 50mm f1.7 Manual Lens. from Japan#45. tiny scuffs from normal use. It shows signs of use. a light haze. There is no separation. I send a product by EMS. There is fog mark. tiny scuffs from normal use. Appperance is very good. There is no separation. ■Optical system(Lens). I think that the picture will be affected. Helicoid and diaphragm work smoothly. This item is clean and beautiful. There is no oil stain on diaphragm. of the product. ■Functional. I participate from Japan. So I can provide you the best service. A few scuffs from normal use. ■ Serial Number. - no accessories. It works but forcus ring move too smoothly. ■ Functional. Near Mint! MINOLTA MC ROKKOR-PF. F/1.7 50ｍｍ lens. Lens is quite clear. From japan. Zoom ring and aperture ring open and close smoothly. Appears in generally in good used condition. tiny scuffs from normal use. The system will walk you through an easy procedure. Opening a dispute is only used when you've exhaused all other negotiations. Recently we have had a lot of problems with people not understanding how their item works. Tiny scuffs from normal use. It shows signs of use. ■ Functional. There is No separation. [Exc ] Minolta MC ROKKOR PF 50mm. MF Lens for MD Mount from JAPAN #112. There is very thin fog on inside of the back lens. I participate from Japan. So I can provide you the best service. But of course it does not affect the photos. Lens is very clean. I participate from Japan. So I can provide you the best service. tiny scuffs from normal use. There is No stain. There is No balsam separation. There is No haze. There is No scratch. I participate from Japan. This item is very clean. Excellent Condition. No fungus. I send a product by EMS. It works properly. All pictures taken from actual item. MC Rokkor-X PF 50mm f/1.7. It doesn't have a Lens cap or anything else with it. I don't know anything about photography or this type of lens. Made in Japan. You will receive what is in the picture. This lens for sale for parts or repair only, as-is. Filter threads bent. Appears to have fungus. [Excellent ] MINOLTA MC ROKKOR PF 50mm F1.7 From Japan. Made and Used in Japan. ＜Excellent ＞Condition. ■ Functional.